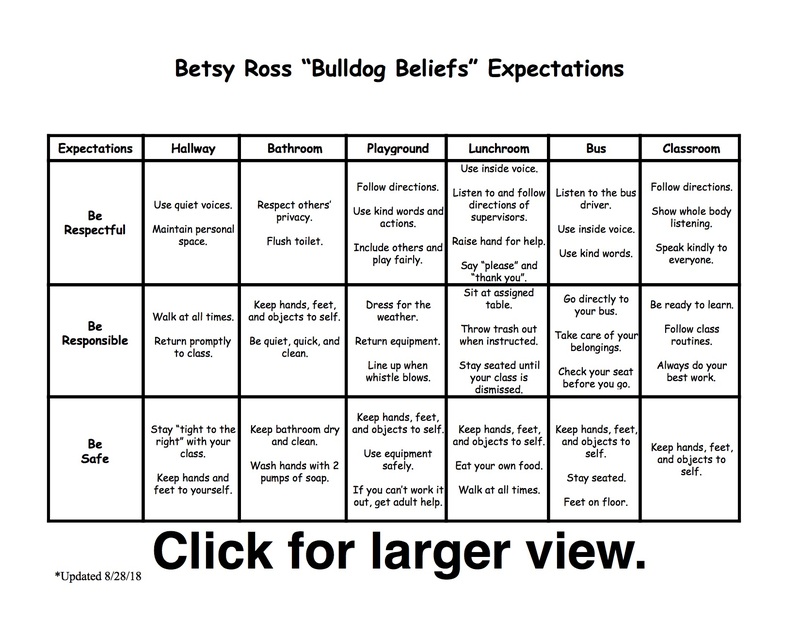 The Betsy Ross Bulldog Beliefs are based upon a school-wide system of support that includes proactive strategies for defining, teaching, and supporting appropriate student behaviors to create positive school environments. 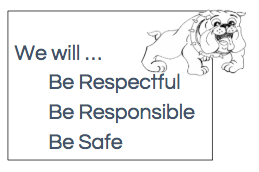 The Bulldog Beliefs Program emphasizes positive behavioral support for all students within a school by setting forth expectations in all classroom and non-classroom settings (such as hallways, restrooms, etc.). Positive behavior support (PBIS) is an application of a research, behaviorally-based systems approach to enhance the capacity of schools, families, and communities to design effective environments that improve the link between research-validated practices and the environments in which teaching and learning occurs. Research has shown that the implementation of punishment, especially when it is used inconsistently and in the absence of other positive strategies, is ineffective. Introducing, modeling, and reinforcing positive social behavior is an important component of a student’s educational experience. Teaching behavioral expectations and rewarding students for following them is a much more positive approach than waiting for misbehavior to occur before responding. The purpose of school-wide PBIS is to establish a climate in which appropriate behavior is the norm. 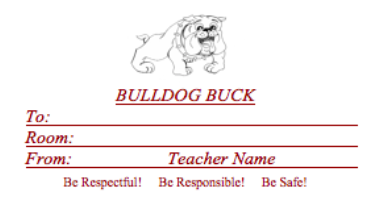 Beginning at the start of the school year, Bulldog Bucks are handed out to students regularly throughout the building. The tickets are dispersed to students who are exhibiting positive behaviors in all settings. 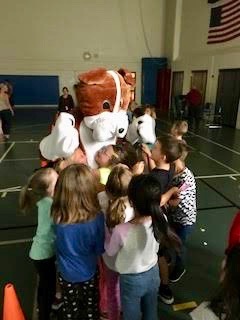 So, whether a child is walking quietly down the hall, demonstrating strong effort in reading class, or supporting a friend in need, you can never be quite sure when a Bulldog Buck may be headed your direction! Students will also be given a chance to earn additional rewards by shopping at the Bulldog Beliefs Store. Each month a new menu of items will be posted. Students may choose to redeem their Bulldog Bucks for the opportunity to wear a hat to school, take part in a special lunch, purchase a collectible trading card from their favorite staff member, or take a selfie with our mascot. Quite possibly, the most excitement during the school year at Betsy Ross is generated in anticipation of our monthly celebrations. These phenomenal events are set up to reward students for the positive behaviors they have exhibited throughout the prior month. Some of our most popular annual celebrations are our Kick Off Pep Rally, the Tug of Strength Competition, and the March Madness Celebration. Both students and staff members alike have a blast participating in these outstanding activities. Perhaps, the most important piece of a successful behavioral system is the communication of clear school-wide expectations. At Betsy Ross School, this communication occurs at least twice per school year. 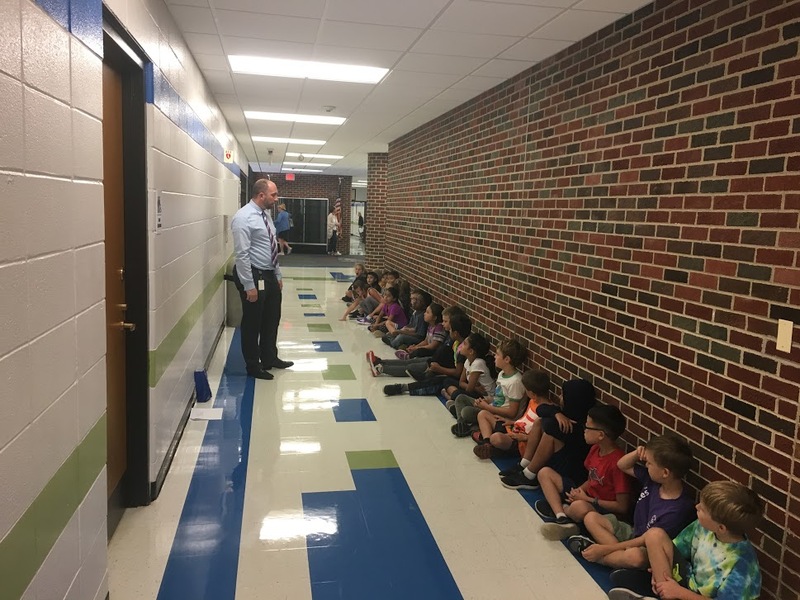 On the first couple days of school and near the halfway point in the year, Betsy Ross staff members host grade level station rotations at designated areas around the building. At each station, a staff member is responsible for leading students through the expectations in each setting. For example, bus expectations include behaviors such as staying seated, keeping hands and feet to selves, taking care of belongings, and following the bus driver's directions. During these station rotations, students often receive their first Bulldog Bucks of the school year. It is extremely important both students and staff buy into the expectations set forth in our station rotations for us to have a successful year.